Macmet has supplied India’s first indigenously designed pipe conveyor to ACC Ltd’s Madukkarai Unit. Macmet has the distinction of supplying India’s longest (2.4 km) EP belting pipe conveyor, carrying 1000 Tons of Limestone per hour. 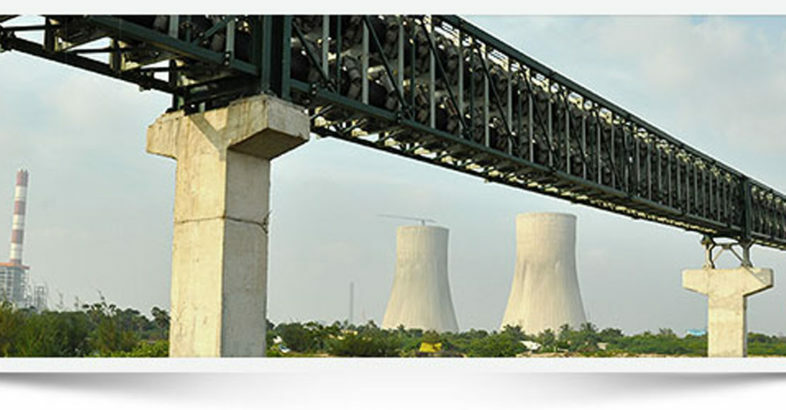 Macmet commissioned the world’s second longest pipe conveyor – 7 km (on an EPC basis) with capacity to carry 1500 tons of coal per hour from Mines to O. P. Jindal Super Thermal Power Plant in Chhattisgarh. Exported Pipe Conveyor System having capacity to carry 3500 tons of Rock Phosphate per hour for Vale’s Miski Mayo project in Peru, South America. Macmet is currently commissioning a 4.8 km Pipe Conveyor, having a capacity to transport 4000 tons of coal per hour. Macmet is also constructing a 7.5 km Pipe Conveyor system for NCCPPL to transport coal from Port to their Power Plant in Krishnapatnam. Pipe conveyors are an environmental friendly solution for conveying bulk material with zero spillage with the ability to cover terrain difficult to negotiate by conventional conveyors. Macmet’s pipe conveyors are being used to carry coal, limestone, sinter, BF dust, in lengths varying from 48 m to 7,500 m.
Pipe conveyors are similar to a conventional belt conveyor at the material receiving area and discharge area. Thereafter the flat belt is slowly shaped to trough belt through transition and carrying idlers. At the end of loading zone, the conveyor belt gradually takes on a pipe formation with the help of variable off set rollers, finger rollers and pipe forming idlers. In the straight portion of a pipe conveyor the bottom three rollers at the carrying side support the belt and material load whereas the top three rollers maintain the belt in its pipe shape. At the horizontal and vertical curved sections, rollers surrounding the belt support the load depending on the direction of the resultant force. The same applies to the bottom or return belt side of the pipe conveyor which may be utilized to transport a second material, thereby reducing capital and operating cost. Development of suitable high resilient flexible belting has acted as a catalyst for the growth and popularity of pipe conveyor installations for several industries.